While fans are eagerly awaiting the April 27 release of Avengers: Infinity War, Marvel is currently in production on Captain Marvel, which is filming in the studio's new production hub of Atlanta. This movie marks MCU firsts on many fronts, with Brie Larson playing the first ever Marvel female title character, while Anna Boden, who directs alongside her longtime partner Ryan Fleck, becomes the first female director for the Disney owned franchise. 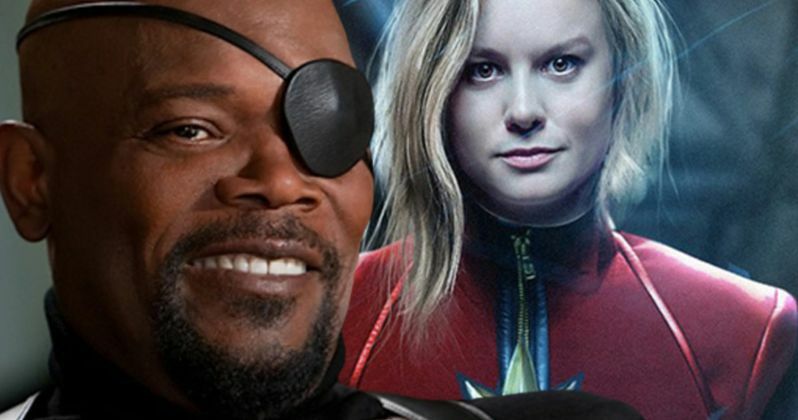 There will also be another historic first within the story itself, which is set in the early 1990s, with producer and Marvel Studios president Kevin Feige revealing that Captain Marvel is the first superhero Nick Fury (Samuel L. Jackson) ever meets, before he loses one of his eyes. Here's what Kevin Feige had to say, when asked how the 1990s setting opens up new storytelling avenues. "We wanted to explore a period before Samuel L. Jackson's Nick Fury had any idea about any of the other heroes and crazy stuff going on in the world. You know, we first met Nick when he told Tony, 'You're part of a big universe. You just don't know yet.' Well, we want to go back to a time when he didn't know it yet, and really showcase and announce that Carol Danvers was that first hero that Nick came across. That meant she could be the singular hero, but place it within timing of the MCU. It also got us talking about different genres, exploring this notion of sort of the '90s action film. We hadn't necessarily done anything like that before either, so there are definitely homages to our favorite '90s action films within Captain Marvel." While the driving force of all the Marvel films are the title characters and their superhero stories based on the Marvel Comics, the studio often likes to play with different genres within the construct of their story. Captain America: The Winter Soldier, for example, was inspired by 1970s political thrillers such as Three Days of the Condor, The Parallax View and All the President's Men. When asked about what 90s action movies helped inspire Captain Marvel, Kevin Feige had this to say, while also confirming that most of the Captain Marvel story is set in outer space. "Well, not necessarily talking about any particulars of the story, but the action elements Terminator 2. That's about as iconic as you get, looking at kind of those cool street level fights, street level car chases, and fun stuff like that. That being said, much of the movie takes place in outer space, as you might think a Captain Marvel movie would. Like all of our genre inspirations, there are bits and pieces here and there." After the massive success of Black Panther, which is closing in on the $1 billion worldwide milestone less than a month after opening in theaters, Kevin Feige was also asked about how the studio will approach inclusion moving forward. The Marvel Studios president revealed that steps have already been taken, with filmmakers that have been hired for future projects they are not ready to announce yet. Here's what Kevin Feige had to say about Marvel's approach to diversity and inclusion. "Yes. I think we're seeing it shift from a very purposeful initiative to just a fact of life, to just a way of doing business. Then there are people we hired that we're not ready to announce in all different capacities, particularly behind the camera. As Panther has so loudly declared, [representation] can only help you, can only help you tell unique stories, can only help you do things in a new, and unique, and fresh, and exciting way. If you do that, audiences will notice it, and appreciate it, and support it." Brie Larson leads the Captain Marvel cast as Carol Danvers, with Ben Mendelsohn playing the main villain, rumored to be Yon-Rogg, alongside Samuel L. Jackson as Nick Fury, Jude Law as Mar-Vell, Gemma Chan as Minn-Erva and DeWanda Wise in an unspecified role. Anna Fleck and Ryan Boden are directing from a script originally written by Nicole Perlman (Guardians of the Galaxy) and Meg LeFauve (Inside Out), which was rewritten by Geneva Robertson-Dworet (Tomb Raider). You can head on over to Entertainment Weekly for their full interview with Kevin Feige.